You should drain a chainsaw's gas tank if the saw is going to go in storage for the season or remain unused for more than three months. Occasionally, the tank may also require draining and/or cleaning for certain repairs. Whatever the reason, you can rest assured that the task of removing gas from the tank and cleaning it is relatively simple and requires only a few basic tools. After draining the tank you must also be prepared to remove any remaining gas from the fuel lines and carburetor of the chainsaw. 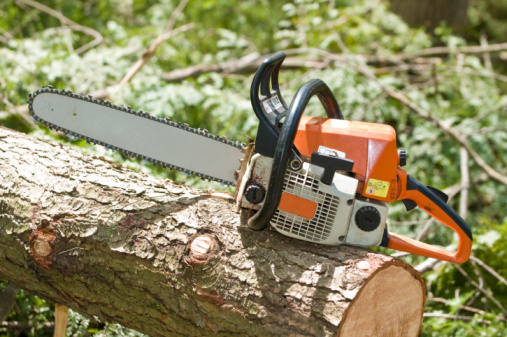 Your chainsaw may not run properly if the gas tank has debris in it. Wipe any dirt/dust away from the gas tank lid and the top of the gas tank with a clean rag. This will prevent any debris from falling into the gas and possibly forming a blockage in the fuel lines or carburetor. Move to a well-ventilated area and unscrew the lid of the gas tank on the chainsaw. Situate your plastic gas can within reach and remove its lid as well. Place the straight portion of your hand siphon into the chainsaw's gas tank. Insert the drainage hose of the siphon into the gas can. Compress the bulb on the siphon to begin suctioning the gas from the tank into the can. Continue until you have removed all the gas from the chainsaw's gas tank. If your siphon has a hand pump instead of a bulb, simply work the pump to begin siphoning the gas from the tank. Unhook the fuel line that connects to the gas tank. The exact location of the line will depend on your specific chainsaw. You may need to remove a plastic guard and small clamp to access and disconnect the line. You'll also likely need a wrench and screwdriver. A small amount of gas may remain in the fuel line. After you unhook the line, try to hold the line and pour any remaining gas into your gas can. Pour a small pack of BBs into the gas tank and add a small amount of commercial gas tank cleaner/solvent. This cleaner is at most hardware or auto supply stores. Make certain the cleaner you purchase is acceptable for use in 2-stroke engines. Replace the lid of the gas tank and shake the chainsaw vigorously. The BBs will act as a mild abrasive and knock any debris loose from inside of the gas tank. Pour the BBs out and flush the gas tank with cleaner. You must ensure all the BBs are out of the tank. Reconnect the fuel line. Pour the gas back into the tank if you plan on using the chainsaw immediately.